When I first saw this photograph I didn’t recognize the location in spite of having walked through the area innumerable times over the years. The wide path across the field, originally known as the West Walk, is now long gone, paved and landscaped. 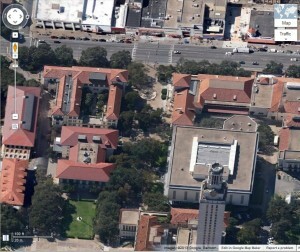 It is now the West Mall at the University of Texas; one of the busiest places on campus with thousands of students and pedestrians walking through it every day. The particular stretch of Guadalupe Street seen in the photo is now commonly known as The Drag and its history as the epicenter of celebrations, performances, protests, demonstrations and even tragedy, is intertwined with the history of the Univeristy and its students. 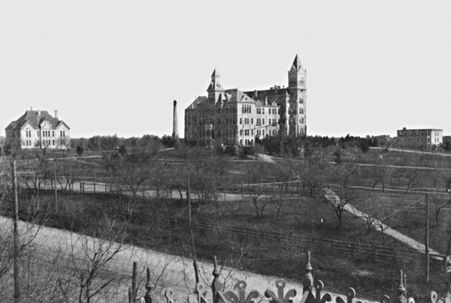 The photograph was taken from one of the upper windows on the west side of the Old Main Building. For whatever reason the photographer decided to capture what was at the time an unremarkable view — a few footpaths crisscross the walk leading toward Guadalupe Street and the residential area just west of the University. A moonlight tower (still standing at 22nd & Nueces) is visible on the left. A few residences on Guadalupe are visible; R.V. Dixon & Co., a feed and grain dealer is on the right near the corner of 23rd Street, which is just visible through the trees. 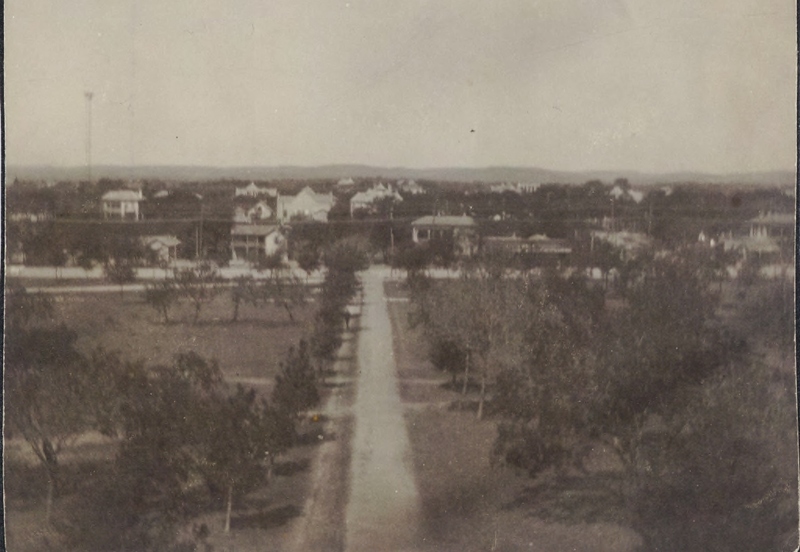 The Wesleyan Presbyterian Church on San Antonio Street is visible in the background and in the distance, the hills west of the city are on the horizon. The Vance/Washington murders happened two block to the north on the same street. 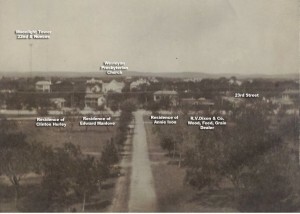 The above photograph from the 1910 Cactus Yearbook shows the same location with significantly more construction and traffic on Guadalupe Street. Battle Hall was constructed a year later in 1911, Goldsmith Hall followed in 1932, and the Student Union in 1933. Dust of ages long ago clings about you now at last. not a window blinks with light. You were not made for pavements, patches, and parterres. Vastness and bluebonnet vista were yours. The past you served, your vision ever forward. A birth and a memory! They pry, loosen, and throw. Soon half will be gone, soon all. Do you hear them changing their Greek and Latin lore? Are you mourners only the ghosts of ages gone? Note on dating the photograph: A label adhered to the back identifies the original photograph as “Austin”. The moonlight towers were erected in 1895 so the photograph could not be dated earlier than that. The original photographic print is consistent with those produced by cameras at the turn of the century. The buildings in the photograph correspond to the 1900 Sanborn map drawings of the same location. 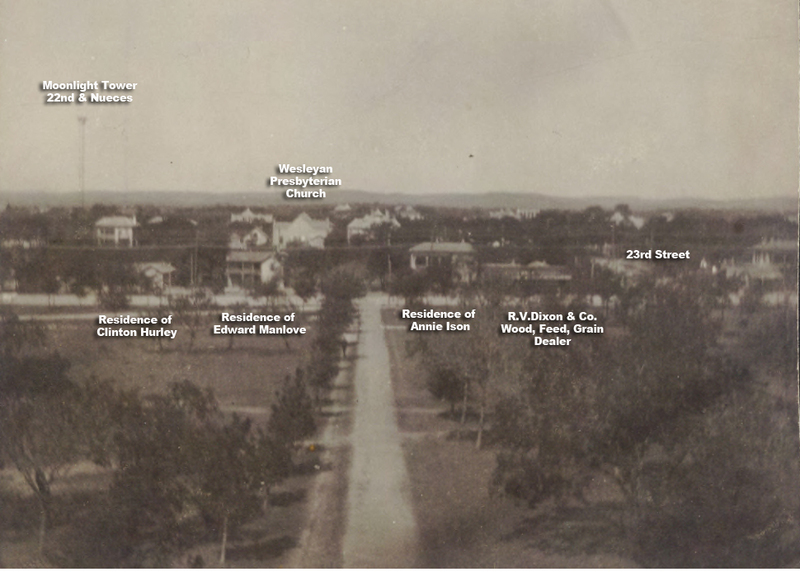 The names of the residences are derived from the 1900 Austin City Directory.